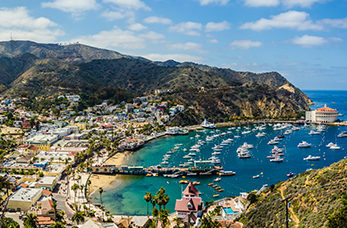 Catalina Island has a rich and storied history, the island served as a stop for smugglers, gold diggers, pirates, and also a popular hotspot for the Hollywood elite in the 1930's to 1950's. The island is only 22 miles long and 8 miles wide and its rugged wilderness and majestic beauty will guarantee you will want to come back time and time again. Take a zip line journey dropping from 600 feet above sea level at a speed of 40mph through Descanso Canyon, your guide will offer interesting talks at each stop before eventually ending up at Descanso Beach. Cruise the crystal clear waters around Catalina Island in a glass bottom boat that gives you a chance to visit Lover's Cove Marine Preserve and discover the tropical marine life amongst the kelp forests. Experience the thrill of watching dolphins in their natural environment on a guided tour as you travel out to Avalon harbour, guaranteed fun for the entire family. Visit the Ruth Mayer Fine Art Gallery, where you will find international scenes and Catalina Island paintings by this American Master Artist in this quaint gallery.